Members of TEI’s Nevada Chapter gather to celebrate their chartering. 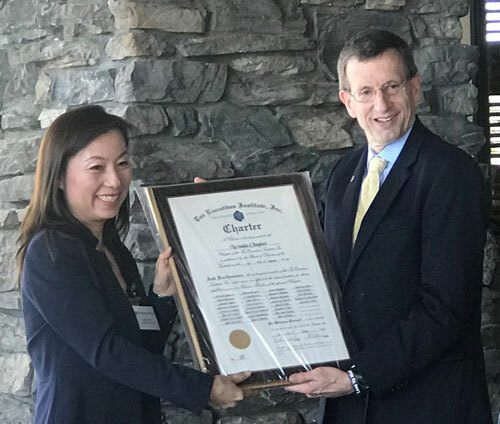 Robert L. Howren, TEI’s international president, confers the Institute’s charter to Nevada Chapter president Susanna Yoo. In mid-May, TEI’s international president, Robert Howren, presided at a ceremony to confer a charter to the members of the Institute’s newest chapter, its fifty-seventh, in Nevada. In welcoming the new chapter to the TEI family, Howren noted that “every new chapter represents a renewal and a reaffirmation of the vision and commitment of TEI’s founders to serve the education, networking, and advocacy needs of the in-house tax professional community. We applaud your efforts and achievements and stand ready to support you in the years ahead.” Chapter members and guests gathered for lunch at Cili in Las Vegas and then for an informative federal tax update session led by Deloitte Tax professionals, which was followed by a festive happy hour. Susanna Yoo, vice president of taxation, Allegiant Travel Co.
Nancy Bowman, director of tax, Pinnacle Entertainment Inc.
Trent Postma, director of tax, Everi Holdings Inc.
Tom Flores, corporate tax manager, Caesars Entertainment Corp.
Tax professionals from Deloitte Tax led a technical discussion on federal tax.